Home / Firewood Devon Latest Projects NEW! 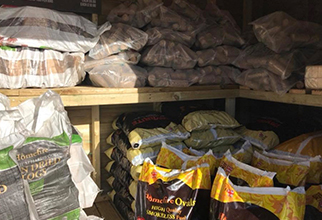 "From logs to pellets, our store is packed full with everything you need." 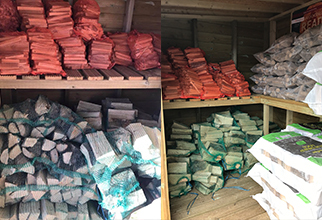 Our showroom, in Dawlish, has a well stocked log store with all the supplies you need to keep your fire burning. Speak to our team on 01626 819 511 to find out more about the supplies that we have in stock or simply visit our showroom today to pick up everything you need. 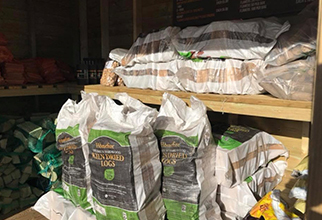 Here at Flamingrate, we are Woodsure assured quality approved suppliers of firewood and stove supplies. Click here to find out more about Woodsure. You can season your own wood. Hardwoods (Ash, Oak, Beech, etc) take over two longer to fully dry out, which is more than softwoods (pine, larch). Hardwoods do burn hotter and longer than softwoods, giving more fuel efficiency and brighter flames. Of all hardwoods are the general consensus of opinion for the best wood to burn is Ash, sometimes known as the King of Firewood. Green wood is best cut and split before being left in a dry. Your store should be a sheltered area with plenty of ventilation to season. Keep the wood off the ground, do not simply cover the wood with a tarpaulin unless you are willing to remove it frequently. Seasoned wood will absorb moisture to replace what it has lost if it is left exposed to rain or in contact with the ground during a frost. Wet wood will rot faster, even properly stored and seasoned wood may not last more than five or six years of storage.